While it may seem like spring is a long way off, one way to ward off those winter blues is to starting planning for this year’s vegetable garden. There are many items to consider when planning a garden. The decisions made can directly impact the potential for disease and other pest issues, in addition to overall yields. Here are few areas that should be considered when planning for your 2018 vegetable garden. When selecting a site for the garden, it is best to select a sunny location with adequate moisture and fertile, fairly well-drained soil. Avoid low spots and shady locations. Prior to planting, it is advisable to draw a map of where each type of plant will be planted. This method allows for considerations into site limitations and planning for succession planting. Begin by drawing a scale model of the garden space using graph paper, or simple maps may be made in Microsoft Excel (Figure 1). Plan to plant perennials along one side of the garden to facilitate ease of tilling. Taller crops, such as sweet corn or tomatoes, should be planted on the north or west side of the garden to avoid shading smaller vegetable plants. 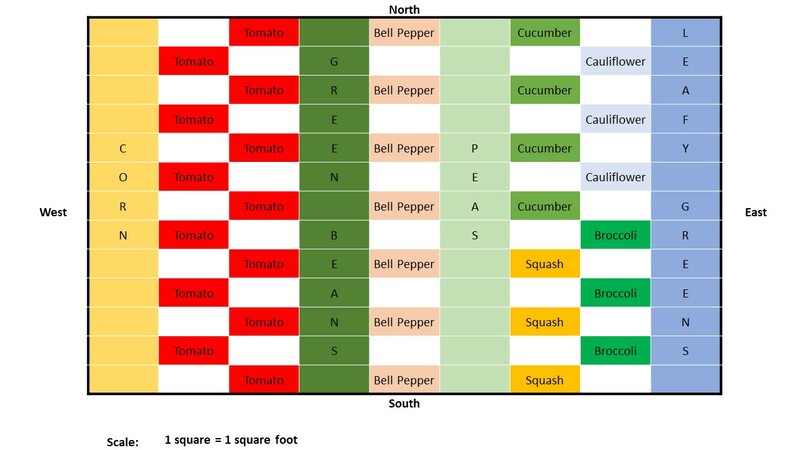 Retain these maps from year to year as a record of crop locations in the garden. If using the same garden site each year, avoid planting the same or closely related crops in an identical place each year. A three-year rotation is recommended, however, even a year or two out of a certain plant family can confer benefits. Crop rotation prevents disease-causing pathogens and some insect pests from building up in soil. Multiple vegetable crops are closely related and are prone to many of the same disease issues. Closely related crops are listed together below. Existing compost piles should be turned. Avoid adding fresh material to current compost piles as this new material is unlikely to break down in time for 2019 garden planting. All new material should be used to start a new pile, which can be used for the 2020 garden. Avoid composting diseased plant material, since home compost piles typically do not reach temperatures high enough to kill pathogens. Water should be added to very dry compost piles at turning to facilitate thorough decomposition. Gardening has now moved into the 21st century. Many mobile applications are available for both Android and Apple platforms. These apps can be used to map out vegetable gardens and maintain records from year to year. Several apps allow the user to enter information about cultivar, planting date, and plant growth. Some apps will provide an estimated date for harvest from this information. A few apps have been designed to diagnose common disease and insect issues. However, diagnosis of plant problems can be a challenging task, even with the assistance of an app. Thus, if plant problems arise in the garden, local County Extension Agents are available to assist.